Antoine Gailleton was a member of the Comité Central Républicain during the revolution of 1848. He was a well known surgeon at the hôpital de l'Antiquaille before he became mayor of Lyon in 1881. He was popular and the people called him 'le père Gailleton'. He was actively involved in the organisation of the Exposition Universelle at the parc de la Tête d'Or in Lyon where president Carnot was stabbed to death. In 1895 he became a Grand Officier de la Légion d'Honneur. In 1900 he lost his position to his former pupil and successor at l'Antiquaille, Victor Augnagneur. He died in 1904 and in that same year the quai de la Charité in Lyon became the quai Gailleton. A monument was erected for him in 1913. 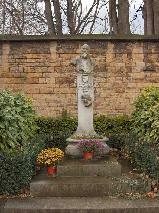 The grave of Antoine Gailleton at the Loyasse cimetière, Lyon.